Victoria is spending less than half as much on social housing as New South Wales, according to a report that also shows homelessness agencies across Australia are being strained by increased demand. Source: The Guardian. The Productivity Commission’s report on government services, released on Tuesday, was labelled a “damning insight into many years of neglect” from both state and federal governments. But the report’s findings were bleakest in Victoria, which was recorded as spending $530 million on social housing last financial year, below NSW ($1.37 billion), Western Australia ($829 million) and Queensland ($628 million). Taking into account its growing population, the commission said Victoria’s expenditure equated to just $82.94 per person, compared with $173.35 in NSW. The national average in 2016-17 stood at $166.93. Victoria’s per person spending on social housing has also fallen each year since 2014-15, down from $95.92 per person, the report showed. During last year’s election campaign, the Andrews’ government faced a campaign from social services groups to build 30,000 social houses over a decade. It responded by pledging $209m to build 1000 new public housing units over the next three years. On Tuesday, Victoria’s peak homelessness body seized on the report to call for an emergency commitment to social housing in the state budget. 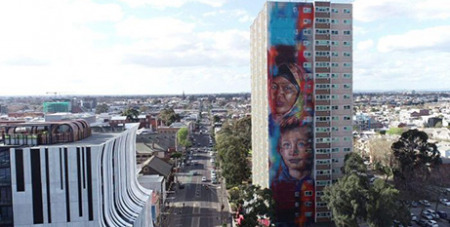 The Council to Homeless Persons cited figures showing Victoria’s social housing stock had fallen by 200 units since Labor came to power in 2014. “The report is a damning insight into many years of neglect of our social housing safety net from both the state and federal governments,” said Jenny Smith, the chief executive of the Council to Homeless Persons.